Do you want decision making power to the Finnish citizens? You can participate in many different ways. Share information about us and direct democracy and the RIC to your friends, colleagues, neighbours, teachers or anyone who walks by. Wear yellow vest and go to the streets. Participate our protests and public meetings. 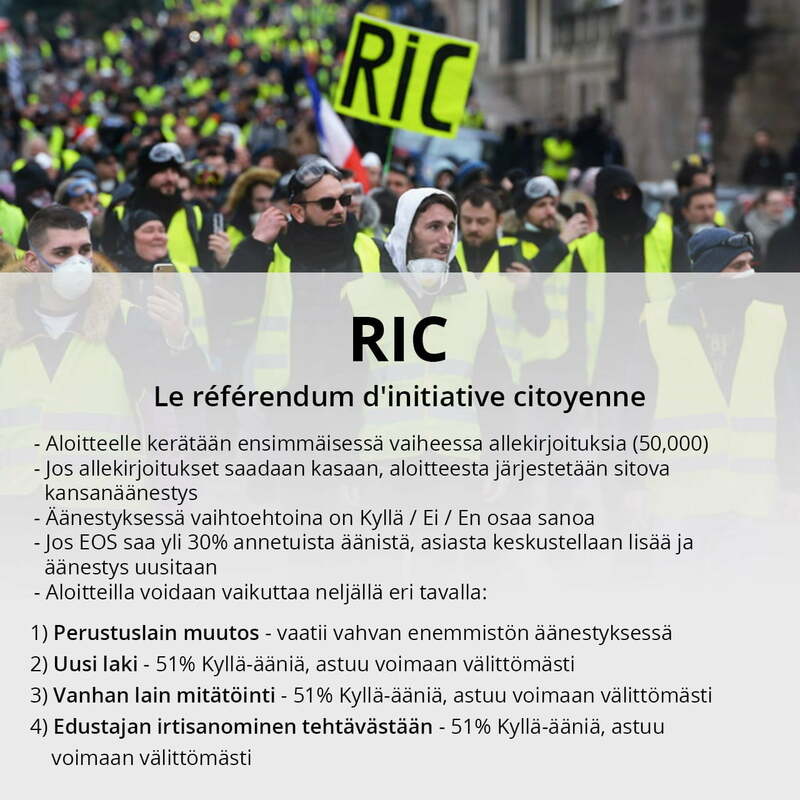 Eventho we yellow vests don’t believe that these current “initiatives” could have any real influence, we’ve listed our demands also into this “initiative”. Parliament and economical elite decides what initiatives they want to process and what not. With this “initiative” we can at least say that we have been trying to use legitimate ways to achieve our goals. It is a bit weird situation when we try to fix their own broken democracy using their broken methods. If we can get like 200.000 names to the initiative the parliament has to somehow process it. If they dont process it, we have one more reason to get to the streets. And this has also huge advertising impact to the movement. We believe that you can stand behind your sign up. Who doesnt want full decision making power which belongs to all citizens? Now go ahead and sign the petition and to take Finland towards the full direct democracy! 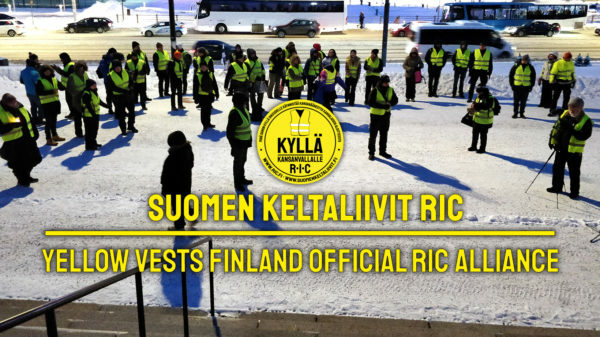 The Yellow Vests of Finland does not have any leaders or leading teams. Like in any other country. Yellow vesters collaborate for the common good and to save this country. You can join the conversation or just follow it at the social media. Because our agenda is not liked by everyone there is lots of rumours and disinformation about us. Only by the links on this website you can make sure that you find all our official social media channels. !! ATTENTION OUR FACEBOOK GROUP HAS CHANGED !! There is a link to this new group. You can find blog platform here. 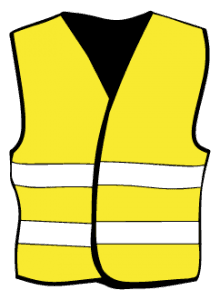 Yellow vests logo is free to use in our protests and where ever you share information about us or the RIC.